The Grampian Highlands area is famous for its delicious malt whisky, and the best way to explore this long-standing tradition is by following a whisky route to eight different distilleries, including the Glenfiddich Distillery that was founded in 1886. Visitors can learn about the age-old process of coaxing different scents, tastes and colours from a mixture of yeast, barley, peat and water. Most distilleries offer tours and tastings but some can only be visited with advanced bookings. Glenfiddich, the most famous and popular, is worth visiting alone if you don't have time for a full whisky tour. 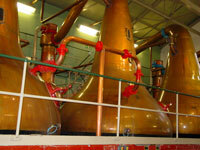 The renowned distillery offers three different tours. The Classic Tour, which is a fantastic introduction to the art of whisky making, takes an hour and includes tastings, it is free of charge with no advance booking required. The Explorers Tour takes an hour and a half, including a more extensive tour and tasting session, this tour should be booked in advance. The Pioneers Tour, lead by the senior guide, provides a four-hour immersion in the world of the distillery and will delight connoisseurs, affording the chance to taste whiskies up to 30 years old.